Dogwood seedlings and trees for sale. Cornelian Cherry Dogwood or Cornus Mas grows 15-25' tall with a similar spread. Blooming in March, they have beautiful clusters of yellow flowers. Hardy from zones 4-8. This small tree or shrub grows well in average, well-drained soil in full to partial sun. It prefers moist soil. Native to southern and central Europe and western Asia, this plant is used for privacy hedges, foundation plantings and specimen planting. Fruits are edible and can be made into syrups or jams. The fruit is also enjoyed by birds. Silky Dogwood or Cornus amomum can grow from 6 to 10' and is hardy from zone 4-8. Silky Dogwood leaves are elliptical, 2-4" long with white or brownish hairs on the veins and turn a dark red in the fall. 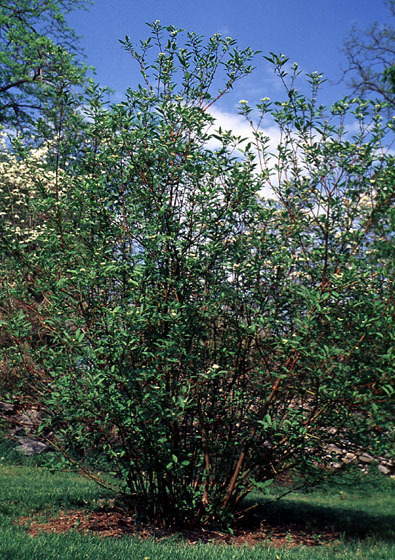 Silky Dogwood has a medium rate of growth and yellowish-white flowers in May. The fruit of the Silky Dogwood are a pale blue 1/4" and are a tasty addition for a birds diet. Silky dogwood are native to the eastern United States generally in wetter areas but is quite adaptable to dryer areas. These dogwoods are relatively disease free. 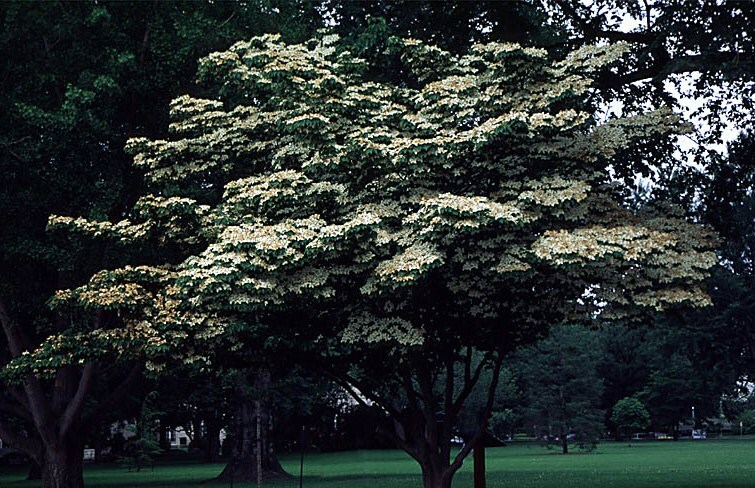 Pagoda Dogwood or Cornus alternifolia grows to around 20' tall and wide. It does best in partial sun and prefers moist soil. In the early summer it blooms with fragrant white flowers. As a plant native to the US it is a wonderful tree to plant for birds and pollinators. In the spring it can be a host plant for the azure butterfly larvae. In late summer the berries of this dogwood turn a pretty bluish black and are enjoyed by birds. This tree is valued for its small size and elegant form, making it perfect for small yard. White Flowering Dogwood or Cornus florida can grow 20-40' tall. Cornus florida is hardy from zone 5-9 and some to zone 4. Flowering Dogwood has a medium rate of growth. Leaf shape is typical dogwood, an attractive and different look in the northern landscape. The bark is attractive with the square and rectangle block pattern. Leaves are dark green in summer and a reliable red in fall. 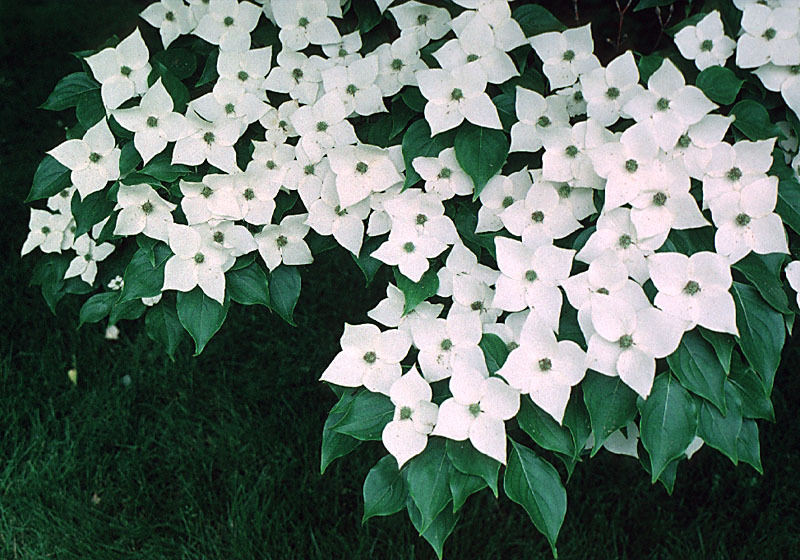 The white flowers emerge in April or May on the Flowering Dogwood and are 3-4" across. Flowering Dogwood berries are about 1/2" in diameter in a cluster and birds love em. Cornus florida is somewhat more disease prone than other dogwood with a few fungus and leaf spot. Flowering Dogwood is one of the finest native flowering trees and is a good specimen tree. There are many cultivars of cornus florida, ours are seed grown for hardiness. Kousa Dogwood or Cornus kousa can grow from 20-30'. and is hardy from zone 4-8 and can be successfully grown in the south. Kousa Dogwood has the typical dogwood leaf dark green in summer to reddish-purple in the fall. The bark on a Kousa is exfoliating and dark brown. Medium rate of growth. The Kousa dogwood flowers bloom in June in Michigan and are a few weeks later than the flowering Dogwood. Gray Dogwood or Cornus racemosa can grow from 10-15' and is hardy from zone 3-8. Often grown as a multi-stemed shrub and is a slow grower. Flowers on the Gray Dogwood are born in late May. Gray dogwood is one of the better dogwoods for dry soils. Native from Main to Georgia west to Nebraska. Cornus racemosa is a good shrub around buildings and parks. Redosier Dogwood (Red Twig) or Cornus sericea can grow to 10' and is hardy from zone 2-7. This shrub grows well in wetter areas, such as near a downspout. Across most of North America it can be spotted along roadways in wetlands. Redosier is a large shrub with bright stems showing off well in winter snows. In mid-spring the red twig dogwood blooms clusters of tiny flowers. Berries are white to gray at maturity and not great for humans, but loved by wildlife. 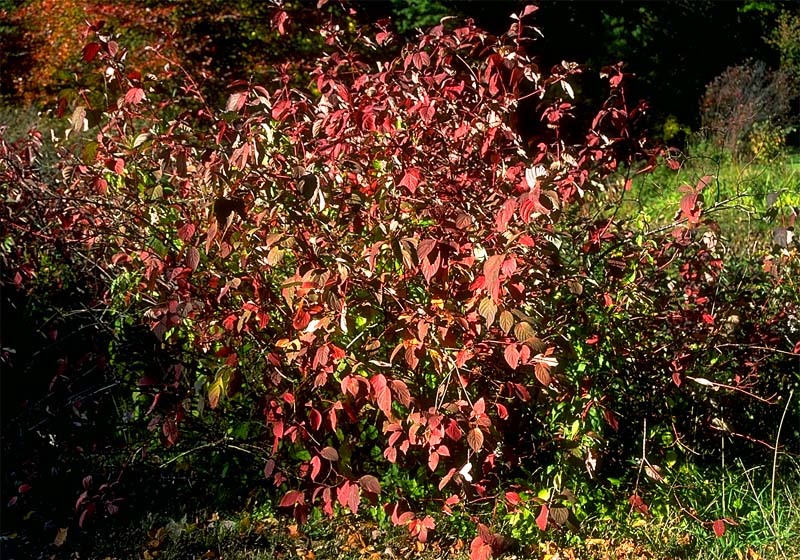 Roundleaf Dogwood: Another red stemmed dogwood, this one is also native to the eastern part of the US and Canada, this perennial shrub grows 3-10' tall and blooms May through June. It has very large, almost tropical looking, leaves and a vase-like form. It is hardy in zones 3-6. Blooms with showy white flowers in a grouping. This plant grows well as in partial sun to shade plant and is very drought tolerant. The Roundleaf dogwood is a wonderful addition to attract both pollinators and berry-eating birds. Brilliant fall colors! To buy dogwood call or use the shopping cart below. To order Dogwoods by PHONE: We're glad to take your order by phone. For your convenience, we have a toll free number 800 568-9179. Phone orders can be charged to VISA, American Express or MasterCard accounts.